I didn’t get very far on my Yarn Journey today. I had to stop and catch up on chores. Cleaning up I came across this sample of crochet form the “Celtic Way” booklet. It is crocheted in size 3 cotton thread. At the time I didn’t like the look, thinking it was too heavy to be pretty. Now I am not so sure, it is kind of interesting, though I do not know what I would make with the technique. You all be the judge, whether it is something to pursue or something to leave behind. 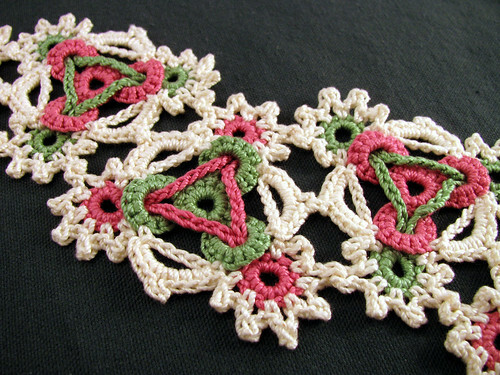 This entry was posted on Tuesday, January 27th, 2009 at 3:00 am and is filed under Crochet, Lace and Yarn. Tagged: Crochet, Doily, Lace, Needlework, Thread, Yarn. You can feed this entry. You can leave a response, or trackback from your own site.